An international team of researchers has discovered a way to use observations at ultraviolet (UV) wavelengths to uncover characteristics about superluminous supernovae previously impossible to determine, reports a new study published in Astrophysical Journal Letters on August 3, 2017. The team, led by Kavli Institute for the Physics and Mathematics of the Universe (Kavli IPMU) Project Researcher Alexey Tolstov, study stellar explosions called Superluminous Supernovae (SLSNe), an extra bright type of supernova discovered in the last decade that is 10 to 100 times brighter than ordinary supernovae. Recently, the team came upon Gaia16apd in a faint dwarf galaxy 1.6 billion light years away. This SLSNe had an extraordinary UV-bright emission (Figure 1) for a supernova of its kind, but no one could explain what explosion mechanism could produce that feature. Theorists have debated that Gaia16apd could fit one of three SLSNe scenarios. These are the pair-instability supernova, having a large mass of radioactive Nickel-56, or a magnetar-powered supernova where there would be a rapidly spinning and highly magnetized neutron star as an additional energy source, or a shock-interacting supernova where the supernova ejecta would interact with the surrounding dense circumstellar matter (Figure 2). Researchers from Kavli IPMU therefore decided to simulate each model using multicolor radiation hydrodynamics to study light in different colors and ranges of wavelengths and see whether any of the simulations matched with the observed supernova. 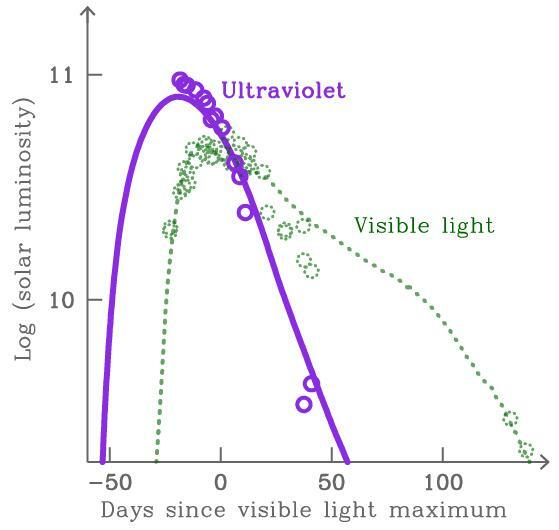 These simulations produced ultraviolet, visible-light and infrared light curves, photospheric radius and velocity, making it possible to investigate the appearance of the explosion at any wavelength. Not only did they discover that Gaia16apd was most likely an shock-interacting supernova, Tolstov and his team found a way to model three different scenarios at UV wavelengths using the same numerical technique. In the future, their technique could help researchers in identifying the explosion mechanism of supernova they observe. "The current study makes one more step to the understanding of the physics of superluminous supernova and helps to identify the scenario of the explosion. The observations and more detailed modeling of the peculiar objects similar to Gaia16apd are highly in demand to find out the nature of the phenomenon of superluminous supernovae," said Tolstov. The next step in their research will be to apply simulations on other SLSNe, and make more realistic models by considering the asymmetry of the explosion and physics of the magnetar-powered supernova.